Last year i posted shots of my range backstop I built back up after some thinning of our trees. I was unable to get it much past 8 ft at the time due to the ground being to soft. I used it up until last week. Over the last year it had compacted down by about 18 inches. So I wanted to make it taller, wider and deeper at the top. I took all the plates and framing down this last week. Friday I added almost 2ft to the width at the top and 2 ft of height. The biggest issue I had was getting the dirt to stay on the top. So i went and picked up some of the Yard wind blow down and an old deer target I had left over. I added that to the layers, it helped widen the top a bit. I then went and picked up several sets of wood pallets. I turned them upside down. I then began packing down the dirt on top. At this point the top is at 8' from the actual bottom. As you can see at the right side I extended the length of the berm by two pallets. Here is the first layer of dirt on the top. Now pushing the berm to almost 9.5 ft. I have about 4 more bucket loads per pallet to put up on top and tamp down. So far it seems to work really well. We will see how it compacts down over the coming year. I still have the 8 hanging targets 6 and 4 inch. 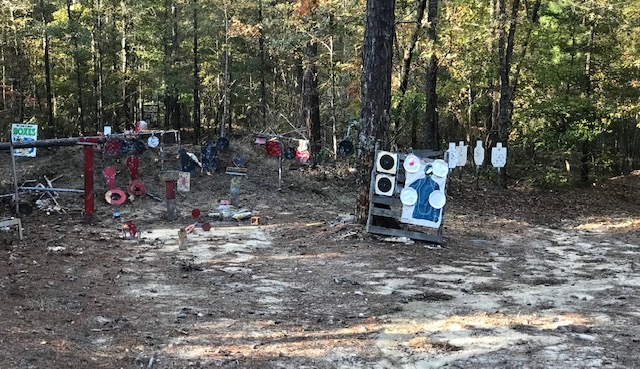 I have the 4 3/4 size ipsc targets that will be going back up. I have 4 8 inch circle targets going back up. I have one of these zero ballistics targets that will be going back in. If i can swing it some time this year i will add one of their dueling trees also. One of each of these poppers. I have 3 of these 4 inch gongs coming, they will have 1 inch holes in the center with a 3 inch gong behind it. Specifically for my long range pellet and 22lr shooting. I really like these targets also. They are top notch. They are pretty expensive. Shooting on your own property. It doesn't get any better than that. Yep, when it is cold I can shoot from my heated closet. When it is humid I can shoot from my cooled closet. When I want to draw from a holster, shoot at 100 yds. I can make up any number of games or configurations for what ever I want to do. I love it. I have to ask this, because I can see where it could become an issue down the line. Can there be any issue with lead contamination of the land? that berm is going to end up with awful lot of lead in it, and some will likely leach out. every range has that issue. At some point in time it will have to be mined. I hate you. And by that of course I mean I'm extremely jealous! That setup is going to be awesome!! How many acres do you have? I've been looking at land for shooting and researching lot sizes and the info I get is all over the place. Overall it seems to depend a lot on your neighbors. I doubt a "home range" will ever accumulate enough lead to warrant mining it out - commercial ranges only do it when they get to "tons" of lead. If you are worried about lead leaching, apply lime to keep the pH of the impact area alkaline. Phosphate fertilizers will also help complex the lead into an insoluble form. If you have a wood chipper, apply wood chips / mulch to the impact area to minimize erosion.
. The oposite side climbs 50-60 ft higher than my shooting position about 200 yds away. Looks great and as was said above I am jealous!!!!!!! A bit more work today. I am almost done with moving the dirt pile i have available for this. I extended this 6 feet on the left hand side in a 40-degree turn. A home Range was one of my FANTASIES when I was a kid in NJ. 30 years later I had my own here in Montana. It IS so absolutely wonderful. OP. what about planting some grass or brush behind and on top of the berm? Would help to keep the dirt in place. That's a great looking range you have built...enjoy! This is what it looks like from my window at about 66yds. This is from 90ft. I dont typically shoot from here. It just happens to be a spot i know the distance from. The tree line is 25 yds give or take to the targets. This is at about 50 ft. The left sid turns in a bit more than the right. The left will give me a 6 ft rail to mount my ipsc plates too. Mostly to have a spot for working from the holster and defensive shooting. The center section extending to the far right side will hold 3 8 foot rails. On those i can mount my rifle plates, and 22lr plates for shooting from my closet window. I like your use of Pallets. I’ll have to do that. The berm on my range is constantly wearing down. This is down at the bottom of hill so even if bullets go over the berm they hit the dirt behind and I own the land behind it for a long ways. The end caps on the right and left side are made using just pallets. On the right there are 6 or 7 high, the left is 8. It seems to do a good job holding the dirt in one spot untill the soil had time to compact. Next year i am going to call one of the wood chipping places and put the wood chips over the top. I think that will also help with compaction and erosion control. your tractor is too clean.... haha My Kubota needs a bath. All that steel looks good. I've found that using Black steel pipe to work better than wood for holding up the plates though wood is less expensive. Also if you can get old fire hose it is easier to work with than chain. I can send you some if ya want to try it. Sorry for the delay, I am still putzin around with it. It has been wet, and mostly a muddy mess. Slow progress the last few days. I have the frames up, I am covering them with roofing tin to help stop the lead splatter from sandblasting them. On the left target stand I mounted my 4 IPSC plate targets, the left middle will have my 4 8 inch round plates on top, and 4 8 inch hanging plates below. The right middle will have that swinging target. 3 4inch plates with 1 inch bullseyes behind them, Then 3 1 inch plates. The far right will have 8 4 inch hanging plates, and paper stands for accuracy work. I bought the Bolt and chain kit from armortargets.com I fitted them to the 12 plates i have. I have 3 more 4" with 1" bullseyes coming. I have 3 3 inchers also. My new plates and poppers have not arrived yet. I did get the rest up.